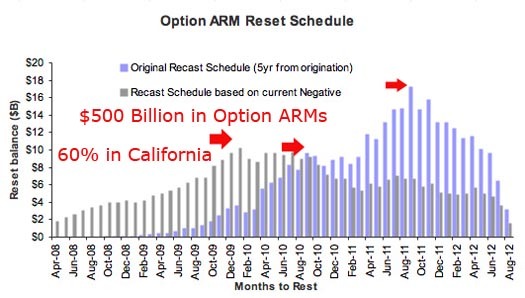 Call it what you will, the next foreclosure wave to hit will largely involve Pay Option ARMs. Pay Option ARMs are adjustable rate mortgages on which the interest rate adjusts monthly and the payment adjusts annually, with borrowers offered options on how large a payment they will make. The options include interest-only, and a "minimum" payment that is usually less than the interest-only payment. The minimum payment option results in a growing loan balance, termed "negative amortization." As Long and Foster’s Ron Sitrin recently commented: because these loans "had negative amortization for so long, they can’t refinance out of them and they cannot sell them because the loans are worth more than the properties themselves." As a recent post on Dr. Housing Bubble stated: "The Pay Option ARM is one of the most poorly construed mortgage product ever to face this planet. It was a pathetic attempt to allow a larger majority of Americans to have a piece of the great American credit ponzi scheme." How’s that for upbeat?